How to Care for a Cairn Terrier. The Cairn Terrier is a feisty little dog that was originally bred to hunt prey burrowing in cairns (piles of stone) in the Scottish Highlands. They are known for being smart, sort of bossy, and independent with a "mind of their own," but they're also good with children and make loving, loyal family pets. A Cairn Terrier might live till 15 or more, and the following steps will help keep them healthy. Take your Cairn Terrier for regular medical checkups and include eye exams, because the breed is prone to eye disorders such as cataracts. You can also do a monthly home exam of the skin, eyes, ears, nose, teeth and gums. Stay current on vaccinations, flea and heartworm preventative. Clean your Cairn's teeth regularly and include professional scalings. Consult with your vet for a recommended schedule. 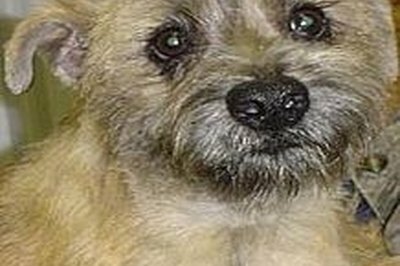 Spay or neuter your Cairn Terrier. Spaying females before the first heat prevents breast cancer and decreases the likelihood of uterine infections. Neutering males before the age of four prevents testicular cancer, helps maintain a healthy prostate and curbs aggression. Feed your Cairn a quality dog food with meat as the first ingredient. Whether feeding store-bought dog food or a homemade diet, make sure it's the proper balance of protein, carbs, fats, fiber, vitamins and minerals. Do not overfeed, since Cairns tend to gain weight easily. Try to limit treats, as much as they love them. Make sure your Cairn gets regular exercise. They can live in an apartment, but are high energy and need regular walks or romps in the park. A yard to play in is ideal for the Cairn, however, they don't do well as outdoor dogs, as they thrive on being with humans. Brush and comb your Cairn at least once a week and there will be little to no shedding and a coat free of mats. The Cairn is double coated with a coarse outer coat and a soft, short undercoat. The coat has a shaggy appearance and doesn't require trimming. It is also weather resistant. Bathe your Cairn about once a month or every other month. Clean the ears with an ear cleaning solution for dogs or baby oil. You can wipe the eyes with a damp cotton ball. Trim around the eyes and ears with blunt-nosed scissors and clip the nails regularly. Pull your Cairn's dead hair out by the roots about every six months. (It doesn't hurt them). Removing the old hair allows new hair to grow in and helps protect the coat from water and dirt. This must be done by hand and not scissors. Cairns tend to be less aggressive toward other dogs than most terriers, however, may still get in scraps. They also tend to be possessive of their belongings, so it's best to supervise their play with children. Cairns love to play ball and learn tricks. Cairns tend to require firm obedience training, but it should be done with sensitivity. Melissa writes for various publications on her favorite subject: pets. An animal advocate, she's covered it all from animal care to rescue to dog parks for The Pet Press, Where Magazine and Best Friends Network and was a writer/editor for the Dallas Times Herald. A former stand-up comic, Melissa has appeared on A&E, VH1 and Comedy Central. She lives with her husband and three mixed-breed rescue dogs and is in search of a purse big enough to carry the 80 lb. one shopping with her on Rodeo Drive.